Everyone in Colombia welcomed the 58 minutes record set up by the National Registry to issue the provisional results of 95.3% of the polling stations, just after the close of the presidential elections, last June 20th. No doubt, to quickly disclose electoral information stops any possibility of civil disorder, increases the credibility of the system and strengthens democracy. However, in Colombia the joy should be dosed, for data submitted to the country are preliminary, or what is the same, are not official and therefore debatable or questionable. In light of this reality, the “speed record” of the election results does not look so appealing, and if we move to what happened in the legislative elections of March 14, any joy vanishes, since in these elections several days were spent to learn about who would occupy the seats of deliberative bodies, and even today, due to the prevailing electoral system, only 90 charges have been officially assigned when it voted to elect 102 seats in the Senate and 166 in the House of Representatives. Since we have previously noted that a voting system that is feasible to choose a position, but is totally ineffective to permit the election of the country as many positions as required, should not be applied, especially when technological development, and even the Law, requires effective mechanisms available, transparent, secure and fast. However, it is not the case of Colombia, in which even though the regulations that laid the groundwork for introducing electronic voting, which adds six years of delay in implementation, is still using the old manual voting that can only deliver first results of unofficial character. In this procedure, when the votes are closed, the judges count the votes cast in the ballot box and fill two sheets of information. The first is the “vote counter”, which consists of a series of boxes where you mark one by one the votes of each candidate and give a final total. This total is placed in the other form (which is the official record.) The Data of the “vote counter” are transmitted to the central telephone information and is what is made known to the public. The day after the election, the formal scrutiny starts in order to assure that the resulting information matches the records. Although fast, this scheme has shown that it is not good for complex electoral processes, and even for a single presidential office, in recent weeks as the public distrust felt when it became apparent substantial differences between the preliminary announced that it is counted manually, aggregated results with information systems. Colombia faces the challenge of modernizing its electoral system and voting arrangements. The law exists, the willingness of the population has already been proven successful simulations of electronic voting, just hope that the political will yielded to the national need and the requirement citizen. The 2011 is near, but there is time to decide and the country fails to submit to unofficial election results, when you can keep them safe, transparent and timely. The nineties hadn´t yet come and Belgium already experimented with voting machines. A pioneer in the use of technology for the exercise of suffrage, in 1991 the country completed its first election using electronic elements and just past June 13 it used again an automated system, not only to comply with an election day, but also through the electronic voting, trying to solve an acute political crisis that it is tougher due to the fact that voting is compulsory in the country, there are three official languages and there will be five simultaneous elections. In this post we like to expose the automated system that is employed by one of the most advanced countries in e-voting practices in Europe, and to do justice, in the world. In Belgium the electoral process, except for the voter’s identification, is fully automated. It begins with the delivery of a magnetic card that the voter must enter into a voting machine that exposes the ballot. Each of the votes is issued with a stylus (pointer-laser light) and once the citizen confirmed that its choice is perfectly recorded, he or she removes the card that is inserted into an electronic ballot box where the votes are stored and encrypted for each voter. At the end of the day, the urn will scrutinize each of the elections and bring the number of votes obtained by candidates in each polling place. The way Belgians vote is described as fast and simple. However it took many years to perfect the system, which allows a variety of security and transparency elements passing through digital signatures, picture of the voter and two voting cards. Several companies have worked in Belgium in the implementation of the automated mechanism. The first was Dzine, and currently two different systems coexist, the so-called Digivote-system (Steria company) and Jitessystem (Stesud Company). To simulate the act of voting in this country, the electoral body placed since 2007 a link that allows anyone experience how they vote in this European country http://www.verkiezingen2007.belgium.be. For the recent elections more than seven million voters were called. 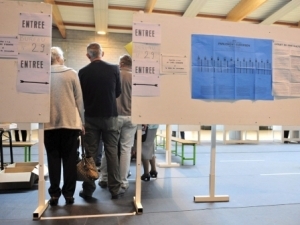 Not everyone uses an electronic system, mainly because of linguistic and political differences, but penetration is substantial: in the region of Brussels and the German-speaking cantons, all voters use electronic voting, while in the Flanders region 49% of the electorate and the French 20% will use this technology. The results are announced, even 15 minutes after the process is closed. Due to the success of the system, several European countries have followed the example of Belgium and today, in the old continent automated voting is used in countries such as Estonia and Bulgaria. Netherlands and Ireland advance in its implementation. Who’s behind the electronic vote? It has a range of automation products for the elections, ranging from the voting ballot of optical scan and tabulation, up to Internet voting. They have the adaptation of data conversion tools and services for the electoral process. They process interactive guides for comitial staff and workers jurisdiction and provide the full line of consumables and accessories. They use project management methodologies and standards that are defined by the Project Management Institute (PMI), and work closely with customers to implement industry’s best practices. Dominion voting system has been used in hundreds of elections in the United States, Canada and the United Kingdom. This month, the company took possession of the assets of Sequoia Voting Systems, a U.S. company with scanning capabilities, high-speed central count and availability of voting equipment with built-in printers (optional) to issue the document verification of the ballot paper. Premier Election Solutions (PES), was acquired by Election Systems & Software (ES & S) on September 2, 2009. As of January 4, 2010, all products and services can be found on the website of ES & S, http://www.essvote.com. Currently, this electoral industry giant serves four countries, 39 U.S. states and has over 4000 polling stations. Among the services provided are the design and printing of ballots, voting process and tabulation of votes with the reporting on election night. It also provides the tools, training and comprehensive support for all phases of the electoral process. The ES & S technology is used especially in the U.S. and Canada. The main motto of this company is “provider of technologies that allow governments to enhance transparency and efficiency of their processes,” through technological innovations in three areas: Election Solutions, Solutions for Identity Management and Systems critical to governments. Regarding the electoral solution of this company, Smartmatic offers all the technologies and services to ensure the success of electoral projects. Smartmatic is the election technology provider with more projects in the world: 200 million votes audited in the United States, Asia, Latin America and the Caribbean. Recently ran the election in the Philippines, the largest electoral project that a private company ever made (50 million voters, 82 000 machines spread over 7,107 islands, about 85 000 candidates, etc.). It is also the only company whose technology has been audited and recognized by major international observation organization from the Carter Center, the Organization of American States and the European Union, among many others. 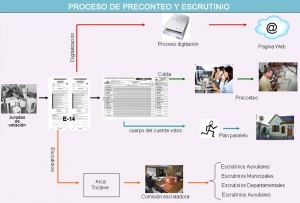 According to their service offerings, Smartmatic can perform all phases of an election with maximum accuracy, and combines a suite of tools with a methodology for managing complex projects that allow the organization of an election from beginning to end, effectively coordinating the thousands of variables and tasks, personnel and hundreds of contractors necessary in the electoral project. Smartmatic is a provider of technology and services for the UN and has a history with some 26 major national and regional projects on three continents. Indra is a Spanish global technology company that operates in over 100 countries in industries as diverse as transportation and traffic, energy and industry, government, healthcare, financial services, security and defense and the electoral area. In the latter, it offers services divided into three periods: Pre-election: consulting, solutions census, process definition, election supplies, public information and training. Election Day: voter registration and identification, automation of the electoral college electronic voting solutions, counting and aggregation and dissemination of results. Post-elections: final count support, allocation of elected and statistical analysis. It claims to have operated in 19 countries, each of which has specific needs and different laws, being able to their technology to the needs of each. Some of the attending nations belong to Spain, United Kingdom, Norway and France.